CES 2014, LAS VEGAS – HARMAN, the premium global audio and infotainment group (NYSE:HAR), has reaped new awards from Daimler to equip Daimler vehicles with advanced connectivity. In a major new telematics project, HARMAN was selected by Daimler to develop and implement the next-generation telematics control unit (TCU), the integrated on-board telematics and infotainment unit connecting cars to the Daimler intelligent traffic management centers. This was followed by an award to install Micro-Electrical-Mechanical System (MEMS) microphones in Daimler vehicles – the first time that microphones with MEMS technology have been used by HARMAN in the automotive sector. The two awards are the latest in a long partnership of innovation between the companies. Terms of the contracts were not disclosed. With vehicle communications technology – of which telematics is a key element – promising to help prevent accidents, save lives, reduce CO2 emissions and improve traffic flow on congested roads in the years ahead, this is an arena offering both Daimler and HARMAN the potential for high volume business. The use of telematics systems is expected to grow significantly in the automotive industry, with most infotainment-employing vehicles also offering high-speed telematics from 2016 onwards.As second-generation HARMAN telematics technology, the TCU offers high-speed connectivity via LTE and state-of-the-art network security technologies for secure, convenient Internet access, and a wide range of safety features including eCall (automated calls from the car to bring rapid assistance to motorists involved in a collision). The system is also field-upgradeable to ensure compatibility with the latest telematics protocols and specifications. In conjunction with the Daimler telematics platform, the TCU system by HARMAN will make for a safer, more enjoyable driving experience. As cars become ever more connected, voice control is becoming increasingly important as a way for drivers to interact with in-vehicle systems. The microphones with MEMS technology, due to be installed in E- and C-Class Mercedes, with S-Class to follow, demonstrate the commitment of Daimler and HARMAN to innovation in every component in the infotainment system. The MEMS microphones deliver the advantage of a small form factor and superior audio sensitivity into vehicles. 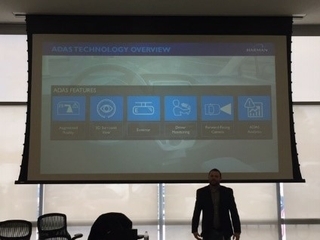 What makes them such a good fit for advanced in-vehicle connectivity is that they are fully directional and able to discern who is speaking and from what direction – this is vital to enable one-shot voice commands from drivers to be understood promptly and accurately. Two MEMS microphones will be installed per vehicle, one above the driver’s seat, the other above the passenger’s seat. Being so small, MEMS microphones can be installed behind the roofliner, enabling highly accurate, hands-free voice control of a phone and vehicle infotainment and navigation systems.The MEMS microphones replace the present microphones which are currently installed in the inside mirrors. Like the TCU, the new microphones will be installed in the first Daimler vehicles for 2016.